A tropical depression strengthened Sunday into Tropical Storm Michael, which the National Hurricane Center (NHC) said could bring heavy rainfall and flooding to Mexico, Cuba and the U.S. Gulf Coast. The hurricane center said the storm could produce rain accumulations of 2 to 4 inches across the Florida Keys through Monday and could become a hurricane by Monday night or Tuesday. Gov. Rick Scott issued a state of emergency for 26 counties in the Florida Panhandle and the Big Bend area, where winds in those areas could reach more than 100 mph. Scott said the storm could turn into a Category 2 hurricane by the time it makes landfall midweek. Scott activated 500 National Guard troops to help with planning ahead of the storm. Another 5,500 were available if needed. "This storm will be life-threatening and extremely dangerous," Scott said in a briefing Sunday. "Every family must be prepared." A tropical storm warning is in effect for the Cuban provinces of Pinar del Rio and the Isle of Youth. There's also a warning in effect for the coast of Mexico from Tulum to Cabo Catoche. The storm could bring rainfall totals of 3 to 7 inches over western Cuba and 2 to 4 inches over the Yucatan Peninsula and Belize through Tuesday. The storm was located 105 miles southeast of Cozumel, Mexico, and had maximum sustained winds of 50 mph, moving north-northeast at 3 mph, the NHC said in its 8 p.m. ET advisory. 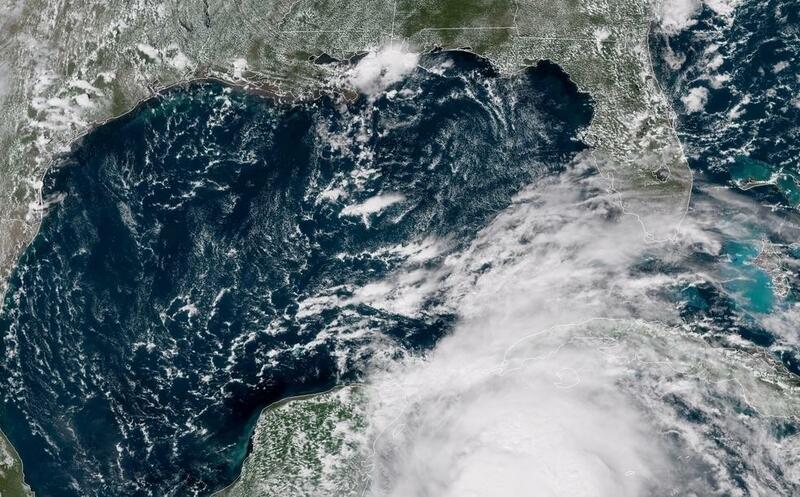 Michael's center will move over the Yucatan Channel on Monday and then across the eastern Gulf of Mexico late Monday through Tuesday night, and approach the northeastern Gulf coast Wednesday.